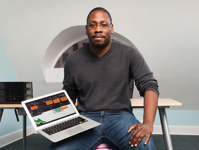 Jon Gosier is one of those well-to-do tech entrepreneurs you may have never heard of. That might be because he made his money heading not to Silicon Valley, but to Uganda. It's there that he was introduced to angel investing, a sort of financial backing used to help startups or small companies get going that typically has a warm and friendly vibe. Gosier found himself investing in several companies not only in Uganda, but also in 11 other African countries, and succeeding nicely along the way. Now he's hoping he can bring this brand of investing to the land that so heavily restricts it: the United States, of course.